Delightful wooden push puppet from Scotland. 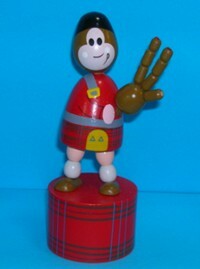 This bagpipe piper is standing on a tartan base and is wearing a kilt, sporran and hat. Is that really a bagpipe in his hands - looks more like a haggis to me !! !